Purchase by Ambre Energy of Cloud Peak Energy’s 50% interest in Decker and related assets, to assume 100% ownership of Decker Mine. Assumption by Ambre Energy of all reclamation and other Decker liabilities and replacement of Cloud Peak Energy’s $66.7 million in outstanding reclamation and lease bonds. Option granted to Cloud Peak Energy for up to 7 million metric tonnes per year of throughput capacity at Ambre’s majority-owned proposed Millennium Bulk Terminals facility in the U.S. Pacific Northwest. GILLETTE, Wyo. 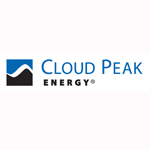 & SALT LAKE CITY--(BUSINESS WIRE)--Cloud Peak Energy Inc. (NYSE:CLD), one of the largest U.S. coal producers and the only pure-play Powder River Basin (PRB) coal company, and Ambre Energy Limited, an Australian and U.S. thermal coal mining and export company, today announced that on August 29, 2014, their companies entered into an agreement for Ambre Energy to purchase Cloud Peak Energy’s 50% interest in the Decker mine in Montana and related assets and assume all reclamation and other liabilities, giving Ambre Energy 100% ownership of the Decker mine. Upon completing the deal, Ambre Energy would fully replace Cloud Peak Energy’s approximately $66.7 million in outstanding reclamation and lease bonds for the Decker mine. The closing of the transaction is currently anticipated to occur during 2014 and is subject to the satisfaction of various terms and conditions. Upon completion of the transaction, Ambre Energy will also grant Cloud Peak Energy an option for up to 7 million metric tonnes per year of its throughput capacity at the proposed Millennium Bulk Terminals coal export facility. The proposed new coal export facility at Millennium Bulk Terminals, which is owned 62% by Ambre Energy and 38% by Arch Coal, is currently in the permitting stage. It is being developed in two stages. The first stage is planned to have capacity of 25 million metric tonnes per year with the second stage taking annual capacity to 44 million tonnes. Cloud Peak Energy’s options cover up to 3 million tonnes per year of Ambre’s share of the first stage and 4 million tonnes per year of its share of the second stage. Cloud Peak Energy’s throughput capacity will have an initial term of 10 years, with four renewal options for five-year terms. The Decker mine is located in Montana’s Big Horn County, in the northwest Powder River Basin. Since operations began in the 1970s, Decker has produced approximately 300 million metric tonnes of coal. It is presently sold to the U.S. domestic market. The Decker mine is serviced by BNSF Railway and produces approximately 3 million metric tonnes of coal each year. Cloud Peak Energy Inc. (NYSE:CLD) is headquartered in Wyoming and is one of the largest U.S. coal producers and the only pure-play Powder River Basin coal company. As one of the safest coal producers in the nation, Cloud Peak Energy mines low sulfur, subbituminous coal and provides logistics supply services. The company owns and operates three surface coal mines in the PRB, the lowest cost major coal producing region in the nation. The Antelope and Cordero Rojo mines are located in Wyoming and the Spring Creek mine is located in Montana. In 2013, Cloud Peak Energy shipped 86.0 million tons from its three mines to customers located throughout the U.S. and around the world. Cloud Peak Energy also owns rights to substantial undeveloped coal and complementary surface assets in the Northern PRB, further building the company’s long-term position to serve Asian export and domestic customers. With approximately 1,700 total employees, the company is widely recognized for its exemplary performance in its safety and environmental programs. Cloud Peak Energy is a sustainable fuel supplier for approximately four percent of the nation’s electricity. Ambre Energy Limited is a privately held company with predominantly Australian and U.S. shareholders. It is headquartered in Salt Lake City, Utah, with Australian headquarters located in Brisbane. Ambre Energy is developing new port infrastructure in the U.S. to facilitate an emerging coal export and marketing business, as well as operating and co-owning U.S. thermal coal mines. In addition to its ownership of the Decker mine, Ambre owns a 50% interest in the Black Butte mine, located near Rock Springs, Wyoming. Working with government, the community and our partners, Ambre is developing world-class export infrastructure while creating jobs and trade opportunities. This release contains “forward-looking statements” of Cloud Peak Energy within the meaning of the safe harbor provisions of Section 27A of the Securities Act of 1933 and Section 21E of the Securities Exchange Act of 1934. Forward-looking statements are not statements of historical facts and often contain words such as “may,” “will,” “expect,” “believe,” “anticipate,” “plan,” “estimate,” “seek,” “could,” “should,” “intend,” “potential,” or words of similar meaning. Forward-looking statements are based on our management's current expectations or beliefs as well as assumptions and estimates regarding our company, industry, economic conditions, government regulations, energy policies and other factors. Forward-looking statements may include, for example, (1) the consummation, or estimated timing of consummation, of the sale of Decker and other related transactions described in this release (the “Transaction”), (2) future development of the Millennium Bulk Terminals coal export facility and exercise of our options for capacity at the terminal, (3) potential future benefits and synergies of the Transaction, (4) anticipated future growth in Asian thermal coal demand, (5) our business development and growth initiatives and strategies, (6) the potential development of our northern PRB development projects, and (7) other statements regarding the Transaction and our plans, strategies, prospects and expectations concerning our business, industry, economic conditions, operating results, financial condition and other matters that do not relate strictly to historical facts. These statements are subject to significant risks, uncertainties, and assumptions that are difficult to predict and could cause actual results to differ materially from those expressed or implied in the forward-looking statements, including the risks that (i) required closing conditions are not satisfied or waived and the Transaction is not consummated, (ii) Ambre Energy is unable to replace Cloud Peak Energy’s surety bonds, including by providing sufficient cash or other collateral anticipated to be required by Ambre Energy’s surety bond providers, (iii) the Millennium Bulk Terminals coal export facility is not developed in a timely manner or at all or at the currently anticipated capacity, (iv) Asian export demand weakens or Newcastle benchmark prices remain depressed, (v) regulatory, political and public pressures against coal usage negatively impact the ability or cost to mine or transport coal to Asian customers, or (vi) anticipated benefits or synergies of the Transaction are not achieved. For a discussion of some of the additional factors that could adversely affect our future results or the anticipated benefits of the Transaction, refer to the risk factors described from time to time in the reports and registration statements we file with the Securities and Exchange Commission (“SEC”), including those in Item 1A - Risk Factors in our most recent Form 10-K and any updates thereto in our Forms 10-Q and current reports on Forms 8-K. There may be other risks and uncertainties that are not currently known to us or that we currently believe are not material. We make forward-looking statements based on currently available information, and we assume no obligation to, and expressly disclaim any obligation to, update or revise publicly any forward-looking statements made in this release, whether as a result of new information, future events or otherwise, except as required by law.